Have you voted yet today? You can vote once every day between now and December 31st! 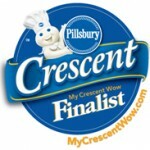 Help me win the title of favorite Crescent Cook and be entered for the chance to win $5,000! You have to fill out the entire form below the pictures and set up an account for your vote to count. After registering the first time, you then have to log in for each subsequent vote (log in area is at the top of the page), hit the vote button, then scroll down and hit the “Enter Now” button. You’ll know that your vote has been counted if you then get a screen that starts with, “Thank you for entering the My Crescent Wow Sweepstakes!” Thank you so much for your support!! For the past few weeks I have been dipping my toes into the waters of the land of people who eat because they have to, but not because they enjoy it. I’ve never understood people who talk about not really enjoying food. Then on September 3rd I had a tonsillectomy and adenoidectomy and got a peek into what those peoples’ lives might be like. The operation caused me to temporarily lose my sense of taste. I could taste a bit, but for the most part what I was tasting wasn’t what I knew I should be tasting. Sweet things just tasted metallic and sour, and everything else tasted like dirty gym socks. Then, a few days after my surgery, my body added an oral thrush infection to the mix, and then instead of things not tasting right or having no taste at all, everything tasted like bread dough that had been left out to rise for 2 days instead of 2 hours. Horrible and yeasty, like I had a barrel of moonshine fermenting in the back of my mouth. I can’t tell you how depressing it was to look at things and want to eat them so badly because they looked so good, but know that I shouldn’t even bother because for one, it would hurt like crazy to try and swallow it down, and two, it wouldn’t taste at all like I know it should. If Dante had written a Foodie Divine Comedy, tonsillectomies/adenoidectomies would have made a great addition to the circles of Hell. So after my brief vacation into “Foodie Hell”, I’m celebrating my return to life. I haven’t quite made it back to normal, as some things still taste a bit off, but compared to where I was, life is pretty good! As my tastebuds started to “reappear” I got a craving for one of my favorite soups, tom kha gai, a spicy Thai coconut chicken soup. So I decided to come up with a soup that would have similar flavors, but would be easy for me to eat. I made a coconut lemongrass somen noodle soup. 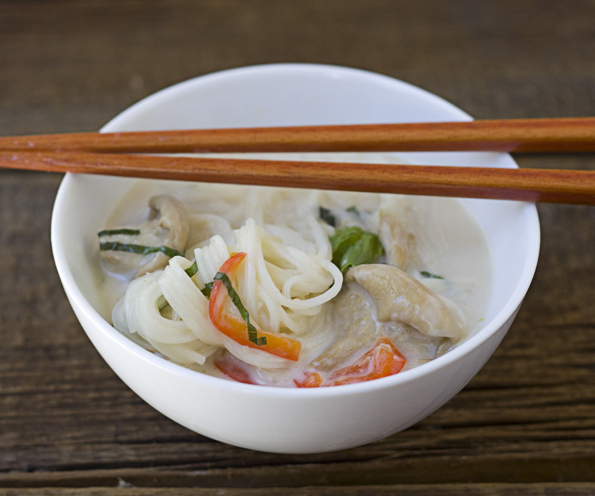 I started with a base of chicken broth and coconut milk (Chaokoh is my preferred brand) and added chopped lemongrass, fresh ginger, fish sauce, thinly sliced red bell pepper, and oyster mushrooms, and somen noodles (very thin Japanese wheat noodles). If you can’t find somen noodles, you can substitute angel hair pasta or vermicelli. When the soup was finished, I added a bunch of thinly sliced fresh basil. The finished soup was creamy and flavorful. The lemongrass added a citrusy brightness without being too harsh. The red bell pepper added color and a bit of texture. The oyster mushrooms were perfect, with their slightly sweet taste that adds a subtle flavoring and pairs so well with creamy sauces and broths. The somen noodles were nice and light. One of the best things about this soup is it only takes 15 minutes to make. The perfect addition to a busy fall day! 1. Cook the somen noodles: Cook the noodles according to the package directions, then immediately drain them in a fine mesh sieve and rinse gently in cold water. Set aside. 2. Make the soup: Combine the chicken broth, coconut milk, fish sauce, oyster mushrooms, lemongrass, red bell pepper, and ginger in a large saucepan. 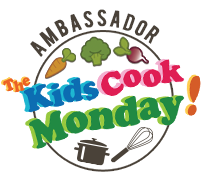 Bring the soup to a boil over medium-high heat, then reduce the heat to low, and cover the pot and simmer for 10 minutes to blend the flavors together. 3. Add the cooked somen noodles and briefly heat through. Remove from the heat and stir in the basil. Serve. 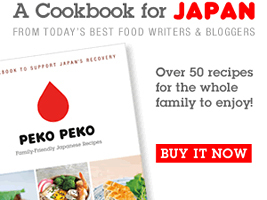 * If you can’t find somen noodles, you can substitute angel hair pasta or vermicelli. A perfect soup for this week’s rainy Toronto weather. 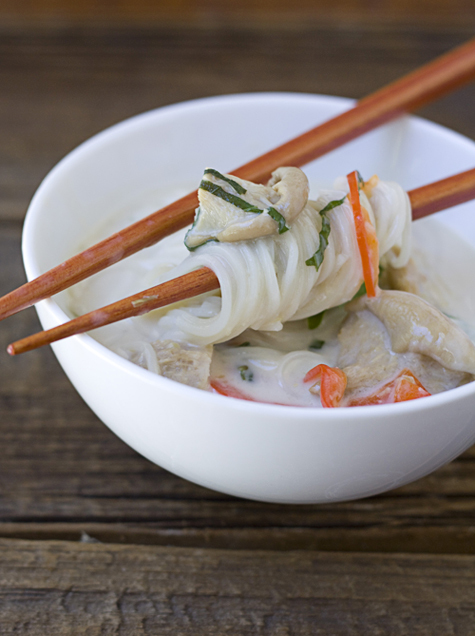 Love tom kha gai so am very excited to make this. My boyfriend’s mom is Thai and when she comes to visit, it’s all about the food. 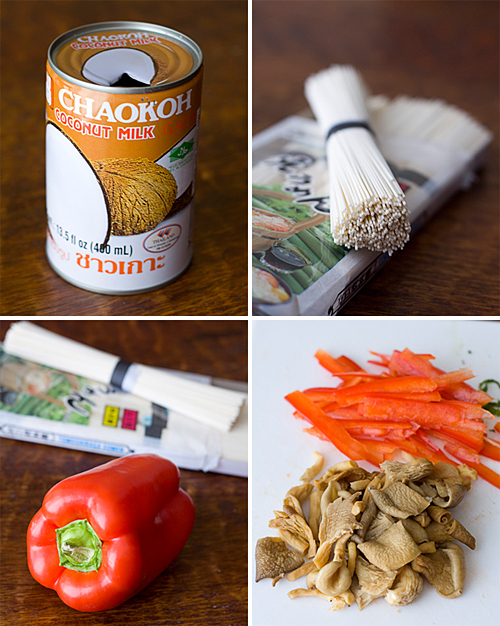 I’ve tried to hang out in the kitchen with her and get her recipes, ESPECIALLY for tom kha gai. Her’s is life changing! Unfortunately I haven’t been able to replicate it on my own because she uses a few ingredients that I can’t get where I live. This looks like a great alternative though. Now I know what I’ll be making for dinner! Looks great! I can’t wait to try it. So glad you are feeling better. That really does sound like one of Dante’s circles of hell! those noodles are calling my name! i know exactly who i’m going to try to make this for…my baby sister would want to take a bath in this soup! This dish looks very tasty and rich. Thanks for the post. That looks so good. I love the combo of coconut and lemon grass. OOh, I feel your pain about getting tonsils and adnoids out. NOT FUN! What is interesting is a remember my first hospital meal after surgery (it was 15 years ago!). On they tray they gave me was a banana popsicle, jello (gross!) and a huge bowl of chicken broth. Boy did I love that broth! Since then chicken broth has been a comfort food for me. And I’ve loved banana flavored foods ever since as well. Hope your recovery is going well! this looks sooo comforting and delicious! I love a good bowl of noodle soup. And somen’s one of my favourite noodles, apart from udon. Very delicate and fine. Oh, I am so sorry that you had to go through all of that! :( It is good to know that you are feeling better though! What a lovely soup…just what the doctor ordered! :) I would love to eat it right up! love coconut and lemongrass. I will have to try it! Good luck with the contest! This looks so good! Glad to hear that you are feeling better too. Thanks for sharing! This soup is wonderful! I had everything except the fish sauce and basil. I did add half a sliced serrano for some heat. I ate this for dinner last night and just finished a bowl for breakfast today. Yum! I hope your doing better today. Can you give us a primer on lemongrass? I have purchased them several times, but end up throwing them away as I just don’t know how to use them. When you say “chopped finely” is that just the thicker base, or do we chop all the way up? Do we take out whole lemongrass our of our soups when we see them in the restaurant, or is it like having a green onion that we’re supposed to eat? I’d like to know how to use it, and maybe you can help. Glad you are on the mend. I hope you continue to improve! @Elizabeth E., What a great request! Yes, as soon as I can get my hands on some lemongrass again I’ll work on that! I’m glad to hear that you are getting better. This looks just awesome! 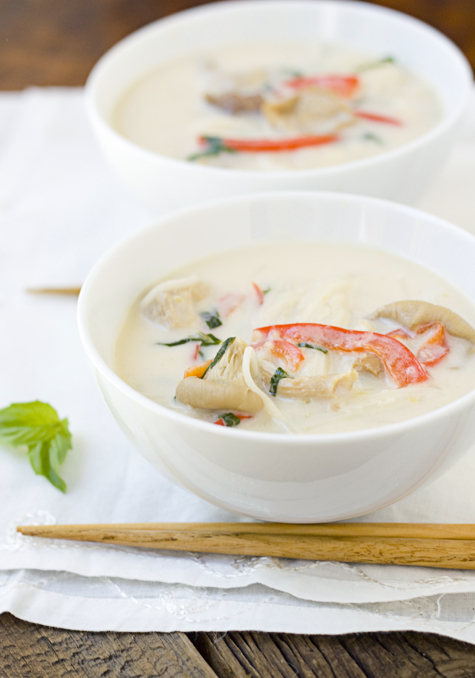 My husband loves tom kha gai but I’ve never made it before since it sounds so foreign to me. This recipe sounds much more manageable. Thanks for great recipe and hope you’ll back to the perfect condition soon!! This soup looks so soothing and delicious, but hearty too with the noodles. @Conor @ HoldtheBeef, I’m jealous that you got to have yours taken out when you were still a kid!! I love your blog! So inspiring! It was so nice to meet you at the PWC dinner! Best of luck to you! @Kasee Thomas, Thanks Kasee! It was wonderful meeting you too! I too, am a big fan of tom khai gai. Because anything w/ coconut milk and lemongrass gets my vote. Just made this recipe for my husband and father in law. They loved it! Although I would change the lemon grass. I tried my best to mince it fine but it still goes down the throat rough, can it still work if I just chop some thick lengths, add them to the soup then take it out at the end? Or is there a way to soften the lemongrass more? 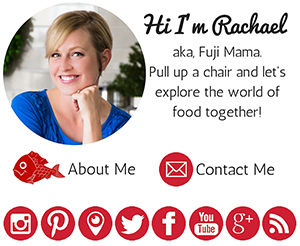 This looks great Rachael! I love somen and always have a bunch of it sitting in my pantry. Usually I just eat in a simple chilled soup but I’ll have to try this. I love lemongrass, but for some reason I just don’t cook with it enough! 18 Ways To Cook Oyster Mushrooms | OMG its Huge… Mushroom Co.
Next post: Gail, from One Tough Cookie, Inc., shares her favorite tools for cookie decorators!